Ever since I first heard about the possibility of an I, Robot movie a few years ago, I’d been pretty stoked. I wonder why it took so long for me to actually see it, but see it I did a couple of days ago. And the verdict? It wasn’t a horrible movie. Guess who was on an old book cover and who in the movie? but it was all right. It wasn’t horrible, and I dare say it was quite fun at points. You see, I have a special attachment to I, Robot, as I am sure is true for countless other people, as it was the first Asimov book I’d read. Starting from this 9-short-story-long book in my eighth grade, I’d read just about everything the good doctor had written by the time I’d completed my eleventh. Just about everything I could get my hands on, anyway. 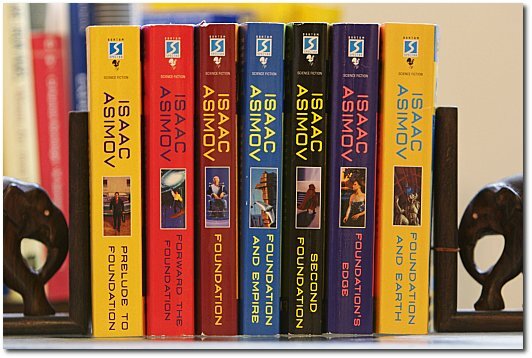 Asimov’s writing—certainly to the little outcast geek within me—was extraordinarily addictive. He was one of the most prolific writers of all time, and wrote all sorts of tales usually set within the realm of science fiction. While one may be quick to lump them all into this category, his works include tender romances, intriguing murder mysteries, expansive world building and so much more. Yes, of course, it takes a certain kind of reader to sigh when a woman admits her only ever love—or physical experiences in any case—to have been with a robot (or another extreme variation of the theme: The man who falls for and marries his protector though he suspects she’s a robot). But I am that sort of reader, and his words clicked with me. Very well. Over those few years, I’d read hundreds of stories—ranging from the shortest of short stories to the most elaborate novels. From a birds-eye view, Asimov’s writing paints a sort of elaborate, pseudo-history of humanity’s future. Starting from our fledgling steps with humankind-changing technology a few years from now (as is the case of introduction of robots with I, Robot), to the rises and falls of humanity as they proceed to conquer the galaxy over the next tens of thousands of years. including some reads I didn’t have access to as a kid. And this time, I’ve been reading them in order. While the superficial import of these tales might seem like something cliched (Evil super-genius will stop at nothing to take over the entire galaxy.) it takes a little more than a cursory glance to realise their true essence (The story of a poor, neglected little boy who is desperate for attention). And, it’s the fact that I can relate to these tales set in a consistent universe so intensely that draws me so much to them. This is a printer-friendly version of the journal entry “I, review” from actuality.log. Visit https://emphaticallystatic.org/earlier/i-review/ to read the original entry and follow any responses to it.